Oncology drugs are undoubtedly one of the biggest cost drivers in healthcare today. The advent of biologics or targeted treatments has been a notable evolution in the oncology treatment paradigm, with the greatest downside coming from the significant costs associated with these drugs. The high drug costs are multi-factorial. It is partly related to costs in respect of drug development and clinical research required to get regulatory approval for the drug. Long patent life of oncology drugs also ensures product exclusivity and contributes to high costs. Once the patent expires for biologics, biosimilars may be introduced into the market although the cost saving associated with biosimilars is less so, than with small molecule generics. This is due to the fact that biologics are complex molecules manufactured in living systems and biosimilars are required to demonstrate equivalent safety, quality and efficacy before getting regulatory approval. Why are Oncology Drugs so Expensive in South Africa? The South African Constitution guarantees the right to have access to healthcare services, and places a positive obligation upon the state to take measures that progressively realise that right. However, often people don’t have access to the medicines they need in South Africa because lifesaving drugs are priced out of reach, while cheaper generics are prevented from entering the market due to patent barriers. This affects all types of drugs: treatments for drug-resistant tuberculosis, cancer, hepatitis, newer anti-retroviral medications for HIV, and oral contraceptives. South Africa does not take full advantage of legal flexibilities permitted under the World Trade Organisation’s TRIPS Agreement to practically and feasibly overcome patent barriers and access more affordable generic medicines. 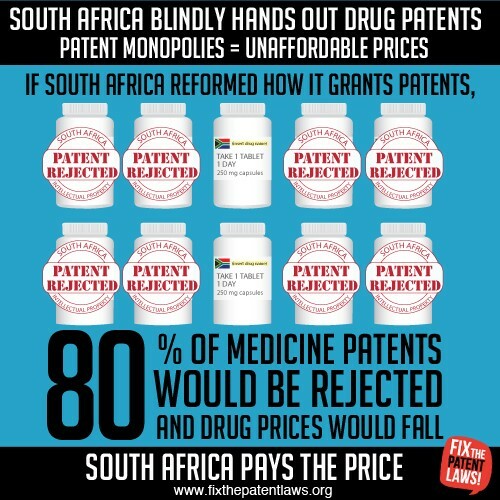 South African patent law lags behind that of other emerging economies, such as India, Brazil, and Argentina, in terms of how it protects public health—South Africa grants more patents on pharmaceuticals than these countries, but also is more willing to grant patent monopolies on medicines than even the U.S. or European Patent Offices. South Africa’s laws have fallen short in promoting economic growth, investment, and the right to health. For the past six years, the Department of Trade and Industry (DTI) has been in the process of developing a comprehensive national policy on intellectual property (IP), which will initiate changes to the country’s patent laws. 1. South Africa does not currently examine patent applications to see if they meet national criteria for what deserves a patent. As a result, South Africa grants patents that fail to meet national patentability criteria. Excessive patenting keeps prices artificially high and medicines unaffordable for patients. Section 34 of the South African Patents Act requires that all patent applications are substantively examined, but to date, the DTI (Department of Trade and Industry) has not taken necessary steps to implement this provision. South Africa must move from a patent registration system to a patent examination system, accompanied by greater public transparency from the Patents Office regarding pending and existing patents. It should also allow for patent opposition from third parties before and after the patent is granted. This creates multiple checks and balances to better ensure a patent is truly new and innovative. 2. South Africa has weak patent standards, which opens the country up to frivolous and abusive patenting practices. Pharmaceutical companies can make minor modifications to existing drugs in order to get multiple patents on single medicines. 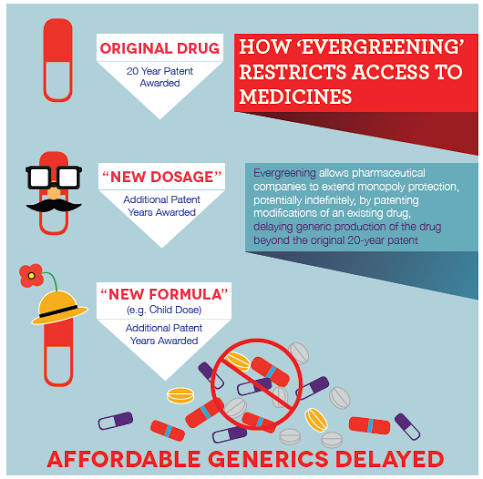 This process – known as evergreening – extends a company’s period of patent protection beyond 20 years and keeps medicine prices artificially high for extended periods of time. To prevent evergreening, South Africa should adopt stricter national criteria similar to that in Argentina or India. This criterion should exclude from patentability new uses, new forms, new formulations, or other trivial changes to existing molecules. 3. Compulsory licenses are one of the critical flexibilities available under TRIPS that countries can use in cases where patented medicines are not available, or too expensive for a country to afford. However, in South Africa, the process for issuing a compulsory license requires a burdensome court process, and to date the country has not issued a single compulsory license on a medicine. South Africa should adopt broader grounds and easier processes for issuing compulsory licenses. 4. South Africa also fails to make use of parallel importation, which enables countries to import patented medicines from countries in which they are sold at lower prices. South Africa should follow countries like Kenya and the Philippines which have amended their laws to allow parallel importation of medicines from across the world. 5. When medicines are patented multiple times, as they are in South Africa, it can hinder research and development of improved follow-on products, such as combination therapies, or paediatric formulations of medicines. South Africa could adopt a broad research and educational use exception to patent rights. This allows means that if a researcher or generic manufacturer wants to work with a patented product to improve upon it in some way that research does not constitute patent infringement. There has been very little transparency from the DTI about when the IP policy will be finalised and sent to Cabinet for approval, and whether the policy will maintain its stance for adopting TRIPS flexibilities. Yet every day the policy is delayed, more medicines are patented, and South Africa pays too much for treatment. 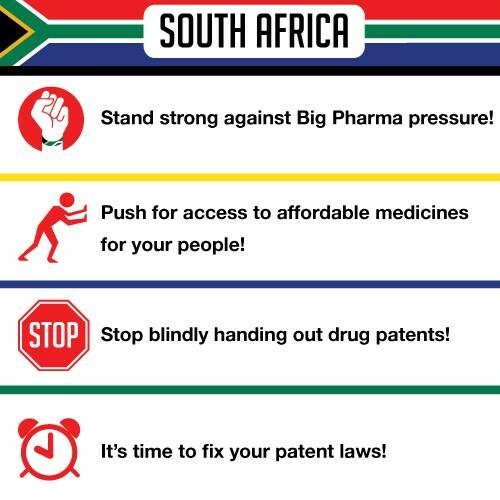 The Cancer Association of South Africa is working with Fix the Patent Laws which consist of a coalition of NGO’S that are campaigning for affordable medicines for South Africans.